If anyone can remember, before the advent of the Apple Mac, all artwork was done by hand, using technical drawing skills to create logos, artwork and drawings etc. In principle, you had to be able to at least draw and have a some creative/artistic skill to even think about entering the design field. It was a real craft. One of the tools we used to use was the technical pen. Several brands were available with the market leaders being Rotring and Staedtler. I tended to favour the Staedtler brand mainly down to the fact that the 0.5 nib seemed to block less oftenthan the Rotring version of the same. While rooting through one of our cupboard here at the studio I found this brand new virtually unused set of pens in the original box! With computer aided design and so many application to help with design, it's easy to see how the craft element has been lost over the years...however, here are PE Creative we still believe that crafting a design is one of the key differentiators that we bring to your design. Anyone can style something up, but not anyone can develop a concept in quite the same way we do. If you'd like to see how we can help you to diffentiate your brand, give us a call on 01332 291141 and we can discuss your specific needs. 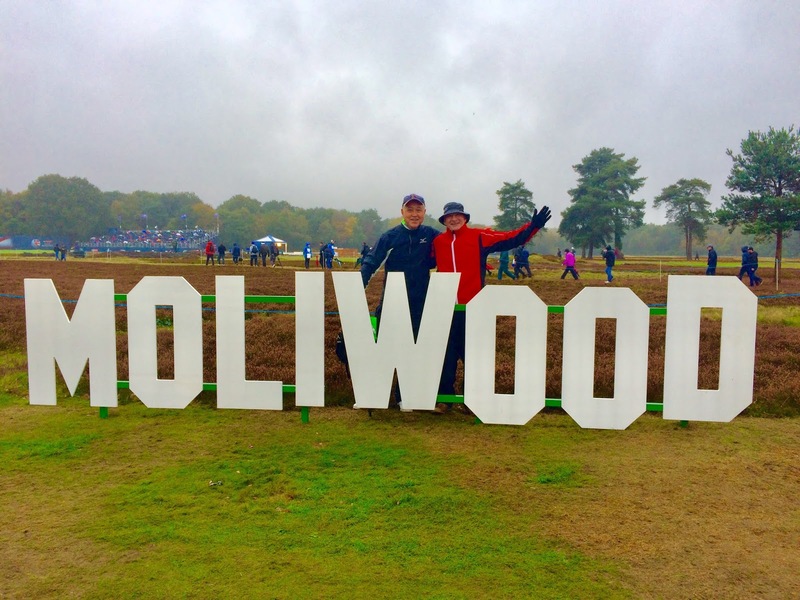 I was lucky enough to win free tickets to the British Masters golf hosted by Justin Rose at Walton Heath Golf Club last weekend. Andy and I enjoyed a windy and wet but fun filled day at Walton Heath where we both got to see and hold the Ryder Cup. 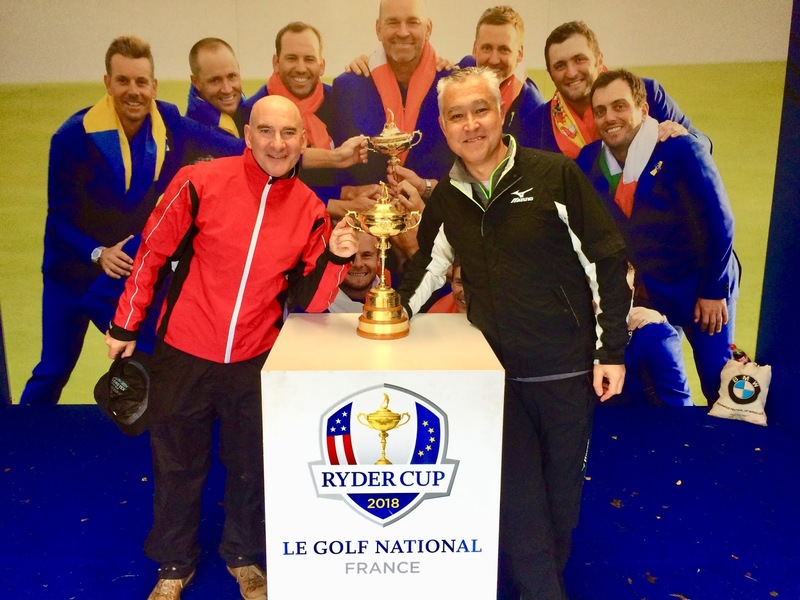 Europe's Captain Thomas Bjorn was at the event and kindly brought along the cup for spectators to see. The eventual winner was Eddy Pepperell who shot a superb score to win by one shot ahead of Sweden's Bjork. 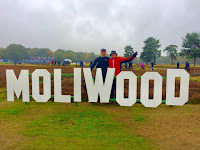 We were also able to enter in to the MOLIWOOD spirit (for those of you who are not golfers, this is a reference to the Ryder Cup winning partnership of Italy's Francesco MOLInari and England's own Tommy FleetWOOD. Whom the press aptly dubbed MOLIWOOD)! I rather like this creative wordplay and I think it would be good for clients to think of type as a way to improve their own communications...If you'd like to hear more about how we use type to great effect, give us a call on 01332 291141. Next week eight interpid golfers embark on the second Wider Cup to be held in Marbella, Spain. This event was renamed the Nick Slade Wider Cup in memory of Nick who sadly untimely passed away earlier this year. Nick was a giant of a man who lived life to the full. A larger than life character with a left handed golf swing who made friends with eveyone he met. He will be missed and I am sure that more than a few toasts will be made in his name next week. The Nick Slade Wider Cup deserved a branding befitting of his charisma, so I designed this logo (based on his lefty swing and customary reveresed baseball hat). 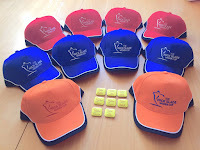 The logo has been produced on all sorts of apparel from shirts and hats to pin badges as well as score sheets and rules etc. 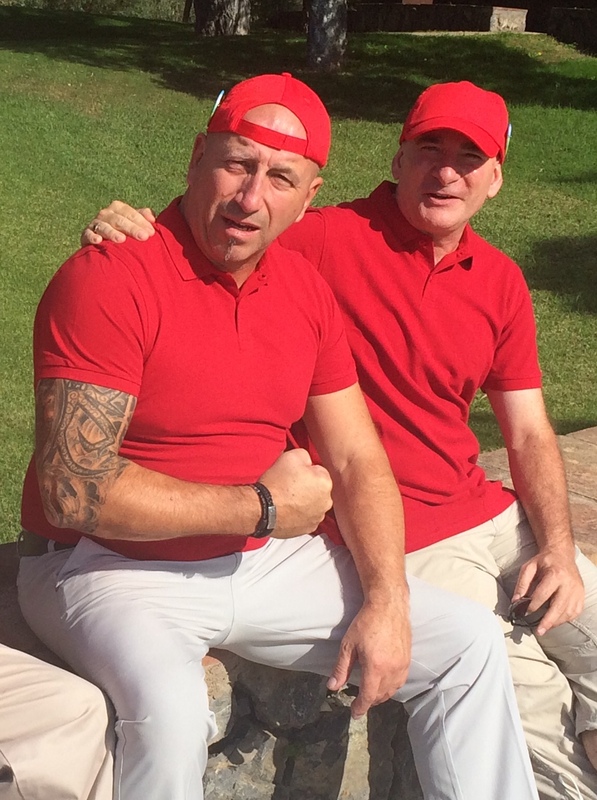 The picture shows Jonny and Nick last year at Santa Clara Golf Club. Further to my last post - we were all licking our lips when this package arrived...! 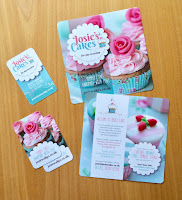 As a thank you for helping her with her website and branding for Josies Cakes, Josie made us a batch of cupcakes - yummy!! I met Josie Gillard when she was but a two week old baby...so its fair to say that she has been in my life for a rather long time! She has always been interested in baking for as long as I can remember so its apt that she has decided to start her own small business making bespoke cakes for the lucky people of Derbyshire. And so it was that Josies Cakes was born. 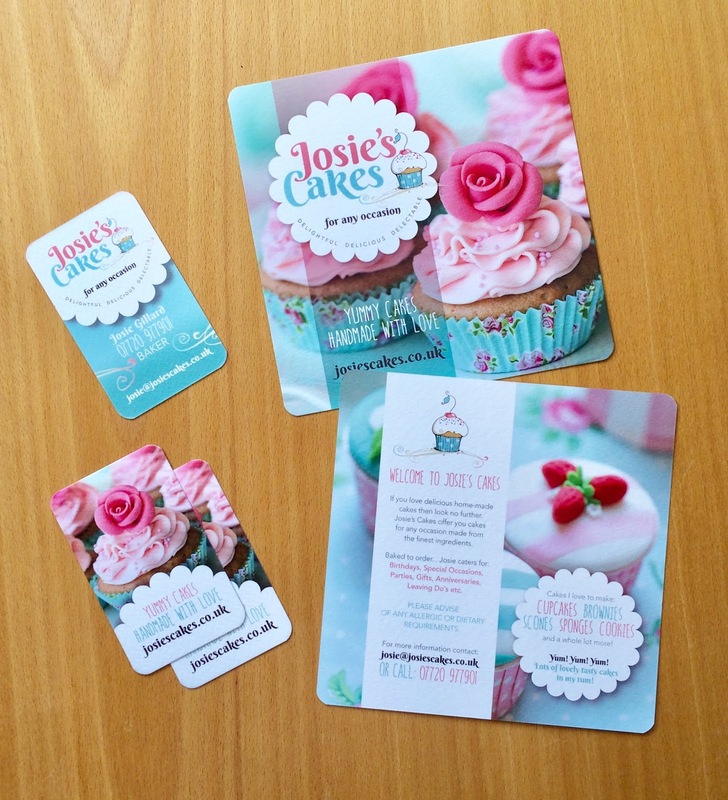 We designed her a lovely logo, business cards, a giveaway flyer and a rather nifty little web site. The cards and the flyer were printed on a very high quality white textured stock and have rounded corners (which we feel compliment the subject). Josie says "the print is lovely, I can't thank you enough". Or if you are thinking of starting a business and need some help with your marketing or branding why not give us a call on 01332 291141 and we will do our best to help.